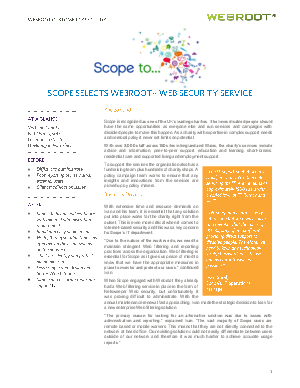 This case study describes how one of the UK’s leading charities used the Webroot® Web Security Service to resolve problems with its existing Web security solution, which revolved mainly around administration and reporting. In addition, since the vast majority of Scope’s workers are mobile the organization needed a solution to protect them. They required a solution that works equally as well on the client side as on the network. After evaluating a number of vendor solutions, including Websense, they chose Webroot. The cloud-based Webroot solution deployed easily and resolved the problems around reporting, which was essential considering the sensitive nature of the charity’s work supporting disabled people. They also gained a solution that is straightforward and easy to use, which reduced burdens on a very lean IT team.